Custom Post Type Causes: Switch to Off to disable the Causes custom post type altogether and remove it from the main menu. Custom Post Type Pledges: Switch to Off to disable the Pledges custom post type altogether and remove the ability for users to give donations through your site. 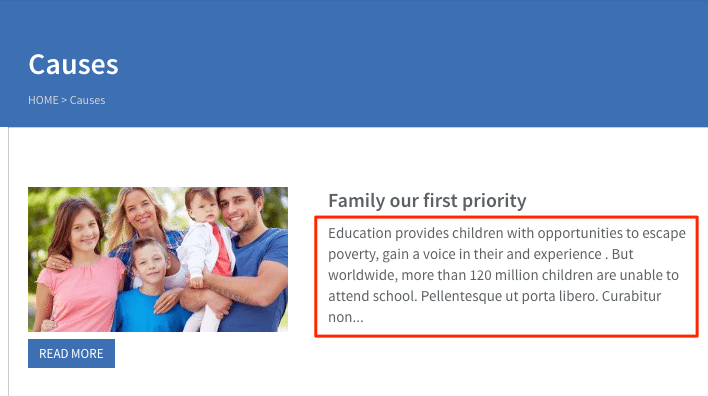 URL Rewrite: The text displayed in the URL when you view a single cause page. For example, set this to cause for your URLs to look like site.com/cause/cause-name. URL Rewrite name: The name displayed in the breadcrumbs when you view the single cause page. Category URL Rewrite: The name displayed in the URL when you access the cause archive, such as a cause category. For example, set this to causes-category for your URLs to look like site.com/causes-category/category-name. Category URL Rewrite and URL Rewrite can’t share the same name. Excerpt limit for list template: Set the length of the excerpt displayed for every cause on the Causes List template. The Causes List template, with a highlight of the excerpt. 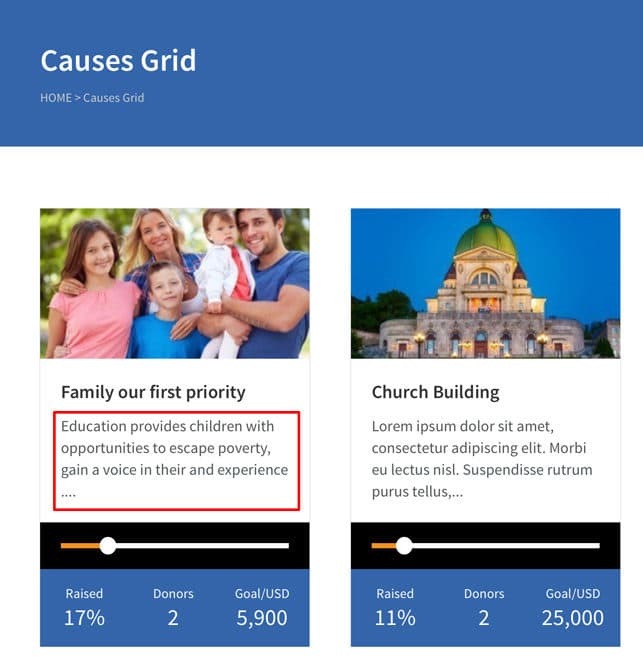 Excerpt limit for grid template: Set the length of the excerpt displayed for every cause on the Causes Grid template. The Causes Grid template, with a highlight of the excerpt. Number of causes per page: Set how many causes per page you want to display on the Causes List and Causes Grid page templates.